This post will be another review about a book. Specifically it's about an Encyclopedia. 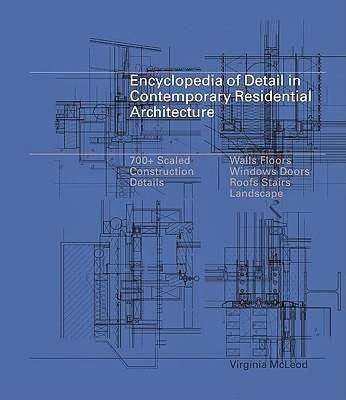 This book goes with the title 'Encyclopedia of Detail in Contemporary Residential Architecture'. The title says it all. It's a big book full of information about detail drawings in contemporary residential architecture, a book that a lot of architectural students, architects, architectural technicians need to get in their hands. It is an Architectural Technicians job to draw detail drawings of a building that will be given to him, however, not everything is clear to us, and I am referring to the detail of the construction of a building. Almost every professional architect is using a book with detail drawings to reference for his own drawings as the information that there is to remember is too much that makes it impossible to draw a detail drawing from memory. This book is the perfect weapon for these situations. The author of 'Encyclopedia of Detail in Contemporary Residential Architecture' is Virginia McLeod and it was published in 2010 by Laurence Kind Publishing Ltd. This book contains scale drawings of ever type of detailing used in contemporary residential architecture. It is a great sourcebook for section drawings such as walls, floors, roofs, windows, doors, stairs and landscape providing at least 50 drawings for each element with keys explaining the construction and materials. In the first section of the book you will find images of the houses that details are included from with a small description of each house in the bottom of the pictures and the number of the detail of each element providing an easy system to find the detail drawings. The houses in this section are organized by main construction material (wood, concrete, glass etc). A page of images of the residential buildings that the details are extracted from. A page with few detail drawings. If you buy the book in a hard copy you will also get a CD-ROM included in the book with all the detail drawings in a digital format. As described in the description of the book 'The book is an invaluable reference work for all architects showing the best examples of residential detailing from around the world'.